Gwen’s gift to Portland is sharing the talent and flavor of local food artisans through her business, Give Portland Gifts. In its own words, Give Portland Gifts is dedicated to celebrating artisan craft, sustainability, supporting the local economy, and giving back to the community by providing high quality gift baskets. As I was talking to Gwen about her business, I sensed quickly that she is just as interested in the success of her vendors as in the success of her own business. She finds joy in sharing the talents and wonderful flavors of the food artisans she works with. The artisans who make the food she includes in her gift baskets are mostly small home-based businesses (with the proper commercial kitchen certification) or businesses that work out of community kitchens. Guided by the idea of the “100 mile diet,” she tries to buy from artisans and vendors within 100 miles from Portland, believing wholeheartedly in the idea of buying local. Give Portland Gifts also provides a personal touch with its gift baskets. Gwen makes personal deliveries of her baskets to the Portland area, and will write or deliver handwritten, personal notes for her clients. She recalled personally delivering a basket for out of town clients to their child who was living away from home for the first time. It was a happy delivery! Gwen seems to thrive on making these kinds of connections with her clients. Gwen also prepares each basket she sells, and does all the shipping herself. 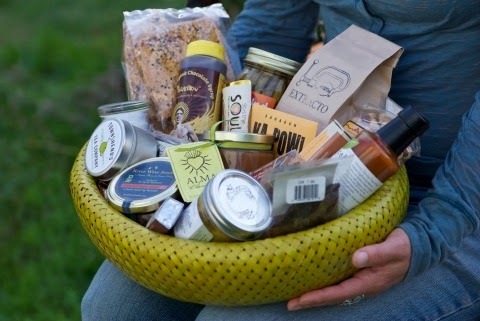 The Flavor of Portland – This is a basket with a mix of sweet and savory goodies. It includes items such as chocolates and candies, nuts, cooking sauces, honey, and more. The Omnivore’s Feast – This basket combines cheeses, meats, crackers and a few sweets to create a picnicker’s delight. Follow Your Bliss – This basket matches sweets and savories with local wine or beer. Some baskets also include coffee and Hot Lips soda. Gwen’s journey with Give Portland Gifts began 3 – 4 years ago. She had left her practice as a midwife, wanting to have more time to spend with her children. Always having enjoyed the great local food, she came up with the idea of creating gift baskets filled with local food products. She started small, with about 20 or so vendors. She selected her vendors by seeking out local artisans and tasting their wares, wanting only high quality products for her baskets. She went to farmer’s markets, vineyards, shops, and fairs to discover what Portland had to offer. Now, she has relationships with approximately 50 – 60 vendors, but uses the same process to seek them out. In building her business, Gwen has developed strong connections with the local artisans and clients she works with. In fact, connecting with the community is important to Gwen. Believing strongly in supporting the local community at large, Give Portland Gifts donates a percentage of its proceeds to Ecotrust’s Farm to School Initiative, which connects local farmers with schools to get fresh, local food into school lunches. Gwen arrived in Portland many years ago from Santa Cruz to go to midwifery school. Gwen feels completely at home here and loves Portland. To her, Portland is a livable city with a town-like feel, with the added advantage of easy access to the outdoors. When she is not making gifts baskets, tasting the local food, or spending time with her children, she is probably hiking in the Gorge or Forest Park, or exploring some other area. Meet Gwen! Gwen and Give Portland Gifts are participating in this year’s “Gifted” at the Portland Marketplace, taking place this weekend, 12/13 and 12/14/2013. She is sharing a booth with one of her vendors. You can also find Give Portland Gifts online here (www.giveportlandgifts.com) or email her at gwen@giveportlandgifts.com. Who are some of your favorite local food artisans or wine makers?